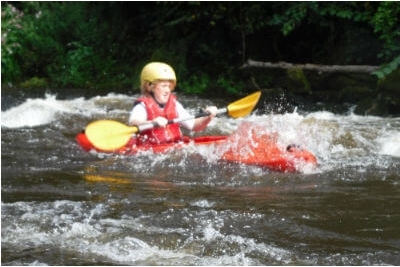 Whether you're new to kayaking or already know the basics, Inspire2Adventure will make it a fun activity - learning in the scenic setting that is the River Wye just adds to the pleasure. Our half-day session is the perfect introduction to kayaking and ideal for families, youth groups and beginner adult groups. 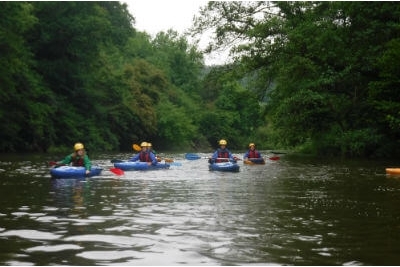 More experienced kayakers will enjoy our guided trips, which includes the challenge of negotiating rapids at Symonds Yat before returning to Monmouth. Your instructor will provide coaching throughout the day, so you'll be able to perfect your technique. It's even better with friends! Kayaking is a great activity to do as a group. Whether you're planning a family trip, want to do something a bit different with work colleagues or are putting together an action-packed hen or stag party Inspire2Adventure will make sure you have fun! Bringing along a change of clothes would be useful for afterwards - just in case you get wet! Thinking of taking up kayaking? If your first taste of kayaking inspires a desire to do more, Inspire2Adventure also offers personal coaching courses and skills development. We'll teach you the skills and techniques required to really enjoy the water. Fancy joining us for a kayaking session? Please call us on 01600 891515 or email for more information and availability.